On Jan. 20, 2015, Tom Wolf will become the 47th Governor of Pennsylvania. Wolf defeated incumbent Republican Gov. Tom Corbett in November with one of the few Democratic victories of the 2014 midterm election cycle. He is the first challenger to unseat an incumbent governor in Pa. since the legislature established a second gubernatorial term in the 1970s. Wolf is a self-described "citizen politician." His background is in manufacturing, although he was Secretary of Commerce in the Rendell administration and was appointed by Gov. Bob Casey to an economic development board and the Legislative Commission on Urban Schools. He's also one of the few governors, indeed one of the few politicians, of the modern era whose professional experience is not that of an attorney. Wolf will enter his first term facing huge budget deficits and a Republican legislature. The culmination of these forces present a significant challenge to the reformist agenda that garnered him electoral support in both the primary and general elections. I spoke with Gov.-elect Wolf about these challenges and what it means to the future of the Commonwealth, as well as the future of Erie. Jim Wertz: Take me back to 8:01 p.m. on election night. Yours was the first race to be called in the country and one of the few Democratic victories of the night. How did that feel? Tom Wolf: It felt great. I was still on my way to the York Fairgrounds when the election was called. I was very surprised it was called so early. JW: It's going to be a difficult transition for you. You recently announced that Pennsylvania was facing a $2 billion budget shortfall. How do we close that gap and how does that $2 billion deficit affect the Wolf Administration's agenda? TW: That's the big question. I'm going to be dealing with that after I become governor. Right now, I really want to understand better what the nature of the deficit is and how big it is. I think before we get into specific solutions we're going to have to understand the magnitude of the hole we have. That's why I actually went to the extent of creating a separate budget task force, not the transition team, but a very important budget task force chaired by a former budget secretary, co-chaired by the president of the county commission of Montgomery County, and then some really good people from the private and public sectors to look into it. Before we get to solutions and possible solutions, of course, I'm going to have to work with the legislature to come up with those solutions. We all have to be on the same page of understanding the nature and magnitude of the problem. So that's what I'm focused on right now. JW: During the campaign, education was the top priority and you still are committed to education, as it remains a priority for the transition. Erie City public schools were significantly impacted by the education cuts under Tom Corbett. How quickly can school systems like ours expect to see some restoration of state funding under Gov. Tom Wolf? TW: Every step starts with the budget. But the answer to your question is as quickly as possible. That's going to be determined in part by how quickly we can find the money in the budget. This budget deficit problem is really important. In terms of education in a place like Erie or York or Philadelphia, part of that also gets to a broader set of questions about how we treat cities. When you talk about schools in Erie or schools in York, you're talking about an educational issue, but you're also talking about the broader disparity that exists between municipalities in Pennsylvania. So we have to address that. But it all starts with understanding the budget challenge we all face. JW: You've said that you'd like to fund education and its restoration with an extraction tax on the oil and gas industry, but you are facing a Republican-led General Assembly. What if the motion to establish this tax doesn't pass the General Assembly? What would an alternative funding model look like? TW: I am hoping that I can go through with the Marcellus Shale tax. That, in and of itself, is probably not enough to bridge the budget gap, so I'm going to have to work with the legislature to figure out broader, more comprehensive solutions to this problem. But that's certainly a priority. I campaigned on that, and I continue to be a strong advocate of a Marcellus Shale tax. JW: Let's say that you get the Marcellus Shale tax. Oil and gas prices are down. Are you concerned that the extraction will slow or cease and thereby impact the amount of money you bring in even if you get the tax? TW: The extraction tax is based in part on production times the market value at the wellhead, so any downturn in the market price is going to be a mathematical impact on the shale tax. But beyond that, it also concerns me because it also impacts the health of the industry. I want this industry to be healthy. I want the industry to do what it does correctly, from a health point of view, from an environmental point of view, and I want it to produce good jobs for Pennsylvania. So yes, any downturn in the price, or anything that affects the health of that industry, should be a concern for all of Pennsylvania. JW: You've mentioned the collateral health effect of the oil and gas industry in Pennsylvania. What are your thoughts on New York Gov. Andrew Cuomo's decision to ban fracking in light of the N.Y. state health inspector's concerns about the viability of the data that's been produced on groundwater contamination? TW: I'm sorry New York took that step. But it's just one more reminder that we've got to get this right. If we don't get it right, if there are health problems associated with this industry, it's not going to work. So we've got to get it right. I think what happened in New York is a reminder that we do have to do this correctly. I've heard that throughout the campaign, and it's a concern that I share. I believe, however, that with the right oversight, with the open exchange of information, we can get it right. We don't have to go the route that New York went. JW: You have a number of people affiliated with Marcellus Shale on your transition team, particularly on the environmental group. But if this doesn't work out, or if there is some kind of disconnect between the work they're doing and the health of the citizens of Pennsylvania, is a ban on fracking, like the one in N.Y., something that's on the table in Pa.? TW: I want to make this work. On my environmental team there are also very strong environmentalists, like Pat Lupo, from your area, so I'm not sure what you mean that there are people from the Marcellus Shale industry on my team. JW: You have a member of the Marcellus Shale coalition and other folks affiliated with extraction on the committee. TW: I want to make clear that I want to hear all sides. I'm not trying to bias the outcome of the deliberations of this group or any group in the future in terms of what this industry could mean for Pennsylvania. I think we have to be very objective about it. That means we've got to look clearly and objectively at the health risks, but it also means we need to look objectively at the economic possibilities, the potential of this industry. I think the right thing to do is to try to make this work. From an environmental point of view, I don't want to make any compromises. From the health point of view, no compromises. And from an economic development point of view, no compromises. So that means we've got to be open to the objective evidence that says if you don't do it right, you have problems. But I also want to make sure that we understand that if we do it right, we could get some benefits from this. JW: Many people are hoping that your background in manufacturing is going to translate well into the Pennsylvania economy. Manufacturing in the 21st century is going to look a bit different than it did in the 20th century. 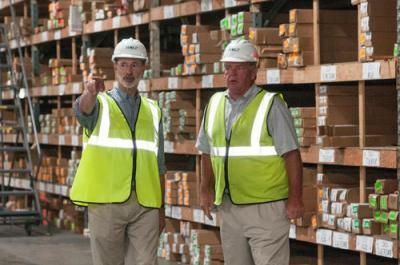 What does manufacturing in Pennsylvania look like moving forward in your perspective? How do we help communities like Erie that were devastated by the loss of more traditional manufacturing to transition in a meaningful way to a new economy with sustainable living wage jobs? TW: Good questions. Starting with the point that I've actually created manufacturing jobs in the United States and not necessarily in leading edge industries, but in very traditional industries. I've done that by recognizing one central truth: We can't compete with low-wage countries in different parts of the world. We cannot compete with countries that play games with currencies or regulations. We can't. We shouldn't. But we have a few really important strengths. We have a great workforce, maybe the most productive workforce in the world. Second, we have a supply line that is tight. We are right at the richest market in the world. It's no accident that the places that are creating these new manufacturing jobs in East Asia are actually creating products and services for the U.S. market. We're right here, and one of the things I did to create manufacturing jobs in the United States was to take advantage of the fact that we are right in the market. So we have a tight supply chain. The final thing is that we have great universities here. There is an intellectual capital here that is unique in the world. So if we combined those things, there really is no shortage of things we can do in manufacturing to create family-sustaining jobs, and that's what I've done. I'd like to push this forward and take advantage of the good workforce, the tight supply chain, and that's why my manufacturing plan calls for things like outright incentives for companies, entrepreneurs, who are willing to create good family sustaining jobs in Pennsylvania. In the United States, states like Oklahoma have had success with things like cash-back programs. I'm talking about that. I have been talking throughout the campaign, and I continue to study ways to connect our universities more closely with the world of work. Some of the good ideas that come out of our laboratories' hard drives or filing cabinets should go into an industrial park. We need to do things like that, and I think the government can play a role in nudging the economy in ways that can actually take full advantage of what I think are the things that actually make us a natural for manufacturing. JW: One of the challenges facing manufacturing and economic development is the age of the infrastructure in the state, everything from roadways and bridges to municipal infrastructure, like water systems and sewage systems. In this economic climate, facing the budget deficit, will we be able to continue funding for programs, like PENNVEST, that help subsidize infrastructure improvements in order to support new business? TW: PENNVEST currently has a net worth of $3 billion and cash-on-hand of almost $1 billion. Infrastructure is really important to me. We did have passage of a transportation bill, which means that we do have funding for infrastructure projects that are long overdue, but it will also help to make that supply chain that I mentioned more efficient. I think those are things that we really ought to look at in a more fulsome way. Just fixing, repairing, and expanding our infrastructure creates jobs. But an infrastructure investment is one of those investments that has a strong multiplier effect and especially in a place like Pennsylvania, the Keystone State, right in the middle of the richest market of the world. Infrastructure investment has to be a key priority and will be in my administration. JW: Pennsylvania has so many great resources in places like Philadelphia, York, and Erie, but Erie is removed from the other urban centers in the state. What role do you see the development of northwest Pennsylvania's waterfront playing in the future of the Commonwealth? TW: First of all, you're right that Erie is sometimes forgotten by a lot of people in Pennsylvania, and it shouldn't be. After all, Erie is the Riviera of Pennsylvania. It's our waterfront. And it's also one of the three great ports in Pennsylvania. People talk a lot about the ports in Philadelphia, but Erie is one of the greatest freshwater ports in the world. We need to take advantage of that. Transportation infrastructure is a big part of that. A lot of the problems that Erie faces are problems that every city, every urban area, faces. We've had the same problems facing Erie schools in school districts around the state. But one thing that I think would help everyone in Pennsylvania is for all of us to take fuller advantage of great places like Erie, and for our state to have a better more robust transportation and telecommunications infrastructure. Especially transportation. If you could get from Erie to Philadelphia in a couple of hours instead of the six, seven, or eight hours it takes now, we'd be in really, really good shape. JW: Thank you Gov-Elect Wolf. We look forward to hearing from you as your administration moves forward.